AI and cognitive technologies are enhancing many different industries and providing significant ROI for early adopters. However, AI is also providing benefit in improving our various experiences in life. 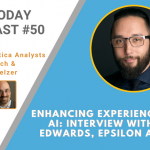 In this podcast, Cognilytica analysts Kathleen Walch and Ronald Schmelzer interview Tom Edwards, Chief Digital & Innovation Officer at Epsilon Agency, who shares insights into how AI is impacting marketing, customer experience, and more.